Australians Try to Save 15 Beached Whales - Integration Through Media ....! (VOA): Australian rescuers were racing against time to save 15 short-finned pilot whales Friday after more than 150 of the migrating mammals beached on the country’s west coast. 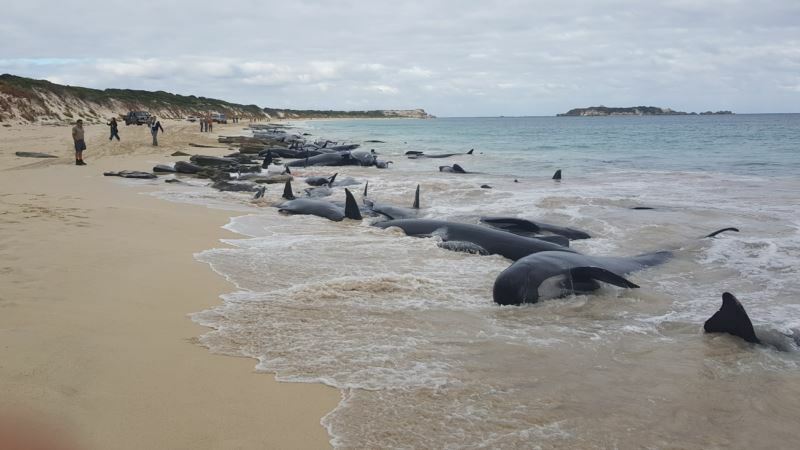 Melissa Lay, manager at the Hamelin Bay Holiday Park, told Reuters by phone that it was the second mass stranding she had witnessed during her 15 years in the area. Locals and tourists were being warned to stay out of the water because of a likely increase in sharks attracted by the dead whales. Short-finned pilot whales are dark-colored with pinkish-grey undersides, travel in large numbers and often get stranded en masse, the department said.